Putting Holocaust victims’ hair on display became a controversial exhibit for the United States Holocaust Museum, when survivors protested that the display would be an exploitation of those who had died. A thought-provoking and controversial documentary, The Holocaust Experience looks closely at Holocaust museums and memorials to evaluate the moral questions surrounding what has become an industry of remembrance. “You see it so much in movies, [but] you really need to come and see it on your own,” an old woman tells the camera as she leaves the grounds of Auschwitz. “It’s very moving,” she notes, then adds, “Too moving,” and chuckles uncomfortably. Sixty years after the Holocaust, survivors are dying and concentration camp infrastructure is beginning to decay. Deliberate efforts must be made in order to preserve the past. 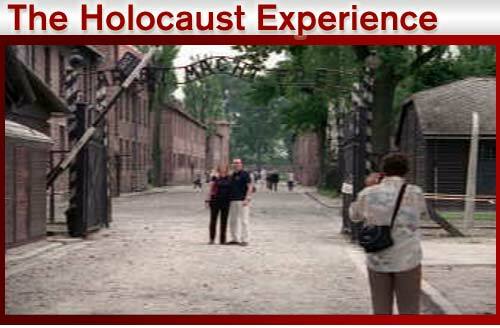 Few would argue the importance of remembering; but is there something wrong with learning about the Holocaust through blockbuster films, or with hopping off a tour bus, in fanny pack and sunscreen, into a concentration camp? Where is the line between remembering the horror and exploiting the dead — and have we crossed it? The Holocaust Experience moves between the noisy, hyper-realistic Holocaust museums in America and the decaying ruins of Auschwitz to quietly critique the role of both as proper memorials. At the Holocaust Museum in Washington D.C., animated tour guides give rehearsed speeches that try to both shock and entertain their groups, while in Poland, tourists arrive at Auschwitz on buses with “Cracow Tours” painted on the side, and pose for pictures at the entrance gate, below the notorious sign reading “Arbeit Macht Frei” (work makes you free). Museums and memorials devoted to Holocaust remembrance do their best to bridge the seemingly irreconcilable gap between notions of what the Holocaust was like and the truth of the experience, but sometimes their tactics are questionable. A group of young Americans explain that they want to be shaken up and shocked, to have the horror put directly in their face so that they can empathize with those who suffered in reality, and imagine how they themselves would react. For them, seeing evidence first-hand at a Holocaust Museum makes it easier to imagine what it was like in Europe during the war. The exhibition of human hair from Auschwitz stemmed from this same impulse, as its would-be curator explains. She wanted to give people a powerful experience. But when a survivor learned of these plans, she pleaded with the museum’s administration not go ahead with it, saying, “The thought that my mother or sister’s hair just might, just might, be on display is simply too painful to bear.” For survivors, using relics of the Holocaust for shock value can be exploitative rather than educational. Auschwitz was once the largest of the Nazi concentration camps, where 1.1 million people were murdered. But sixty years have passed since the world learned of the genocide that took place there, and now the documentary’s camera captures icy, poetic shots of beautiful young girls jogging around the camp, little boys playing soccer nearby, and a woman hanging up her laundry to dry right next to its fence. Earth that was stained with the blood of over a million people is now casually trod on everyday. This human ability to continue on after others have suffered unthinkable horror has been a subject that poets and artists have wrestled with for centuries. Regardless, it’s still disturbing to realize how numb we can be to the most heinous acts. At one point in the film, a tour guide tells a group about a mother forced to deliver the body of her dead two-year-old child to a crematorium. The listeners look through the glass display – all with dry eyes – and then keep walking. How do we wrench people out of such complacent, passive “remembering,” while still respecting the memories of the dead? This is the immense challenge that The Holocaust Experience forces us to confront, as the actual experience of the Holocaust recedes further and further into the past.